Primerica has been helping Main Street families invest for the future since 1977. While many financial professionals simply aren't interested in working with the middle class,* Primerica is committed to helping Main Street families save and invest for their short-term and long-term goals. There's no doubt that investing in mutual funds involves risk. But a PFS Investments representative can help you to understand those risks, and guide you to mutual funds that match your investment objectives and risk tolerance. Investors should carefully consider the investment objectives, risks, charges, fees, and expenses of any mutual fund before investing. This and other important information can be found in the fund prospectus and or summary prospectus, which may be obtained from PFS Investments, or by calling the fund or by visiting the fund's website. Please read each fund's prospectus carefully before investing. *Diversification does not guarantee a profit or protect against loss. A managed account is accessed through an investment platform. The platform typically offers access to actively managed investment models comprised of securities selected by investment professionals. When your account is managed through the Lifetime Investment Platform, you will have an ongoing relationship with your advisor and will receive professional money manager services, and consolidated reporting. The Lifetime Investment Platform investment model offering provides you with access to a wide range of asset allocation strategies. Your Primerica Advisor will assist you in selecting the professional asset manager and models that will help meet your asset allocation and financial goals during your investing lifecycle. The investment models are constructed using mutual funds, exchange traded funds (ETF) or a blend of both investment types. By working with your Advisor, you will be able to identify the investment model options most aligned with your personal goals, time horizon, risk tolerance, and investing preferences. You can always adjust your investment plan and model selection to accommodate changing needs. Variable annuities are long-term contracts between an individual and an insurance company. Variable annuities contain both investment and insurance features and are designed specifically for retirement. Fixed annuities are long-term contracts between an individual and an insurance company. Fixed annuities provide a fixed rate of return that is guaranteed by the issuing company. A fixed indexed annuity is a long-term contract between an individual and an insurance company. Fixed index annuities provide a higher rate of return than a fixed annuity, but the return is not guaranteed. PFS Investments' 401(k), 403(b) and 457(b) plan offerings are individual and employer-sponsored retirement plans that grant employees the opportunity to contribute a portion of their salary on a tax-deferred basis into investment vehicles, such as mutual funds and annuities. K-12 schools, colleges, churches, hospitals, etc. Investments in annuities are not FDIC insured or bank-guaranteed and may lose value. Guarantees offered in fixed annuities are subject to the claims paying ability of the issuing insurance company. Variable annuities are sold through PFS Investments Inc. and are subject to market risk, including the possible loss of principal. Variable annuities are sold by prospectus only. All investments are subject to risk, including the loss of principal. It is important to remember that there are risks inherent in any investment and that there is no assurance that any money manager, mutual fund, asset class, style, or index will provide positive performance over time. Investors should carefully consider the investment objectives, risks, charges, fees, and expenses of any mutual fund before investing. This and other important information can be found in the fund prospectus and or summary prospectus, which may be obtained by calling the fund or by visiting the fund's website. Please read each fund's prospectus carefully before investing. Want to save $1 million by age 67? You'd better get started soon. The longer you wait, the more you'll have to put away each month to reach your retirement goals. 27 years old? You have to put away $214 a month to reach $1 million. Start at age 37, and you're putting away $541 a month to reach your goal. Begin at age 47, and you'd have to put away $1,491 a month. Wait until age 57, and you're putting away a hefty $5,168 a month. Wait until the last minute (age 62) and you'd have to stash $13,258 a month to reach $1 million by age 67. So, the sooner you start saving, the fewer dollars you'll have to put away each month to reach your retirement goals. 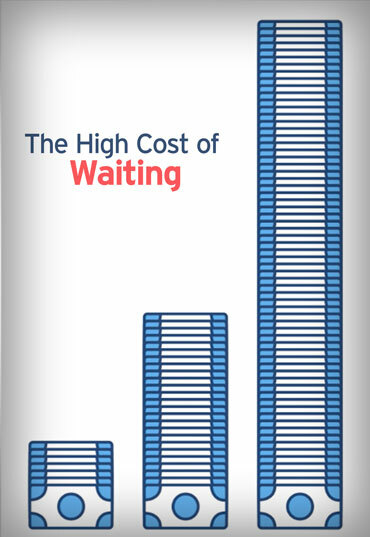 Don't pay the high cost of waiting! This example is hypothetical and does not represent an actual investment. This uses a nominal 9% rate of return, compounded monthly. It uses a constant rate of return, unlike actual investments, which will fluctuate in value. It does not include fees and taxes, which will lower results. All investments are subject to risk, including the loss of principal. It is important to remember that there are risks inherent in any investment and that there is no assurance that any money manager, mutual fund, asset class, style, or index will provide positive performance over time. Investing in mutual funds entails risk, including loss of principal. Shares, when redeemed may be worth more or less than their original value. Prospectuses for variable products issued by a MetLife insurance company, and for the investment portfolios offered thereunder, are available from your Registered Representative. The contract prospectuses contains information about the contract's features, risks, charges, and expenses. Investors should consider the investment objectives, risks, charges, and expenses of the investment company carefully before investing. The investment objectives, risk and policies of the investment options, as well as other information about the investment options, are described in their respective prospectuses. Please read the prospectuses and consider this information carefully before investing. Product availability and features may vary by state. Please refer to the contract prospectus for more complete details regarding the living and death benefits. There is no guarantee that any of the variable investment options of a variable annuity will meet their stated goals or objectives. The account value is subject to market fluctuations so that, when withdrawn, it may be worth more or less than its original value. Please contact a Registered Representative for complete details. Variable annuities are long-term investment vehicles designed for retirement purposes. Withdrawals of taxable amounts are subject to ordinary income tax and if made before age 59 1/2, may be subject to a 10% Federal income tax penalty. Withdrawals will reduce the living and death benefits and account value. Withdrawals during the first eight years of the contract may be subject to surrender charges. See the contract prospectus for more information. PFS Investments Inc. is a subsidiary of Primerica, Inc.. For more information about PFS Investments Inc., please visit www.brokercheck.com. Not all products/services available in all states. In the United States, securities are offered by PFS Investments Inc., 1 Primerica Parkway, Duluth, Georgia 30099-0001. Our minimum investment thresholds are among the lowest in the industry: $1,000 in voluntary accounts, $250 in IRA accounts or as little as $50 in any account if established with a monthly bank draft of $50 or more. To cover the cost of maintenance and tax reporting required by IRS regulations for retirement plan contributions and distributions, retirement plan accounts (IRAs, 403(b)7s, etc.) are charged an annual custodian fee of up to $50 per each unique Social Security Number. In addition, those accounts would be charged a termination fee of $30 at the point that all account positions are closed under the same Social Security Number. PFS Investments Inc. (PFSI) is an SEC Registered Investment Adviser DBA Primerica Advisors. PFSI is a member of FINRA and SIPC. SEC registration neither implies nor asserts the SEC or any state securities authority has approved or endorsed PFSI or the contents of this disclosure. In addition, SEC registration does not carry any official imprimatur or indication PFSI has attained a particular level of skill or ability. All product guarantees are based on the claims-paying ability and financial strength of the issuing insurance company.